It's been a while between drinks but it's always a delight to wake up and find an email from the Former DC Staffer in the inbox waiting to go. This one is a Christmas themed message. During the '80s both DC and Marvel used to have very small holiday parties. There was never very much money for these events but they were always welcome. One year Marvel did exceptionally well and decided to have a staff only party and handed out special invitations to the event. A production staff artist at DC was determined to get in so borrowing a Marvel staffers invite he spent two days in the DC production department constructing an exact forgery. It was positively perfect once completed but most of us thought he’d get caught for sure. The next day we asked how the Marvel party was and he said it was a BLAST! Ingenuity at its best. Happy Holidays! It was the dinner I missed due to a number of reasons, and I'm still kicking myself - in fact it's going to be one of the biggest regrets of my life. Going around the table we have (from left to right) Norm Breyfogle, Rich Buckler, Michael Netzer, Alan and Pauline Weiss and Dave Simons. Personally I think I'd have been a bit too starstruck to contributed to any meaningful conversation. 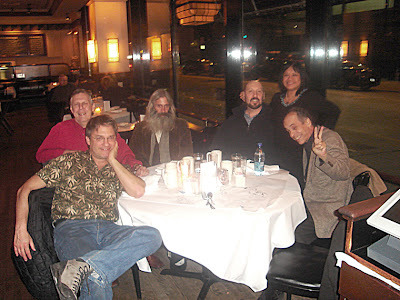 The dinner is having some offshoots though, in 2008 I'll be working with Michael on a project, I'm still working with Norm, Alan and myself are busy with our creator owned project and Rich and Dave have both gotten back in touch. I couldn't ask for anymore. Let me break your heart though. All five artists drew on the tablecloth and left it behind. Makes me cry thinking about it.